Last month, on Valentines day, Ballroom Thieves came to town. By far one of my favorite shows. Great live band, superb songwriters, beautiful voices and harmonies. I'm a sucker for female voices, and if she can shred the cello, twice the sucker. Check them out, the new album is a great listen. I started working on the next gig poster for Honest Folk Presents and realized I forgot to post a poster from a past shows. 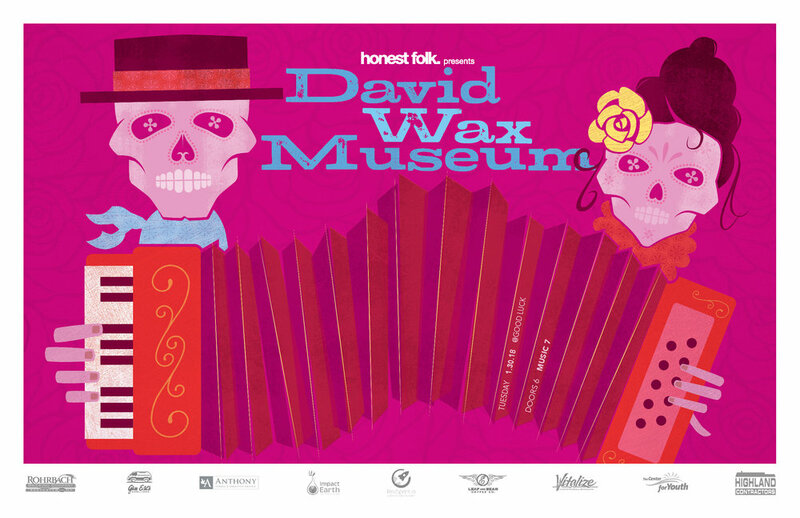 David Wax Museum, entertaining band, hard working couple making music and building a solid following. Give them a listen and you'll hear a Mexican/Latin influence, hence the sugar skull illustration. I love making gig posters, I also love discovering new music. When Honest Folk Presents brought Ann Tivel and Jeffrey Martin to town, I dove into both artist's work. It was kind of a bonus to explore two artist for one show. Both artist have their own unique sound, both write beautiful lyrics and both are great performers. Together on stage equals an incredible live experience. For this show I designed two gig posters giving them each their own identity, but when placed side-by-side creates a story of two artist communicating with each other. 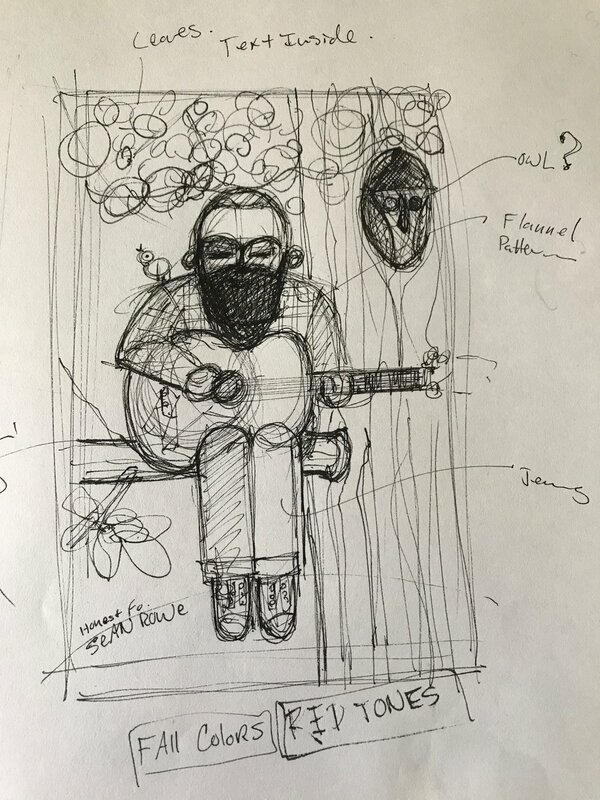 I was sketching ideas for a Sean Rowe gig poster, via HonestFolk Presents, while listening to Mr. Rowes tiny desk concert on NPR. Between songs, Sean tells a story about spending an extended amount of time in the forest. It's a funny tale but also serves as some insight on Sean's interests and personality. As it turns out he's a real life woodsman, foraging his meals, creating shelter, and simply living on natures offerings. Check out his tune "I'll Follow Your Trail," I love the contrast with his baritone voice singing such a sweet song. Issue 23 of POST is here, visit the website to order an issue or find out where you can pick one up. Check out the article on Andy Buck, sculptor and professor at R.I.T.. Great sketches, it's interesting to get a peek inside his head. The sketch on page 12 has a list of list of bands scribbled down the right side, great musical taste Mr. Buck! I created the illustration for Mary Stones great article on social workers in Rochester, a must read. 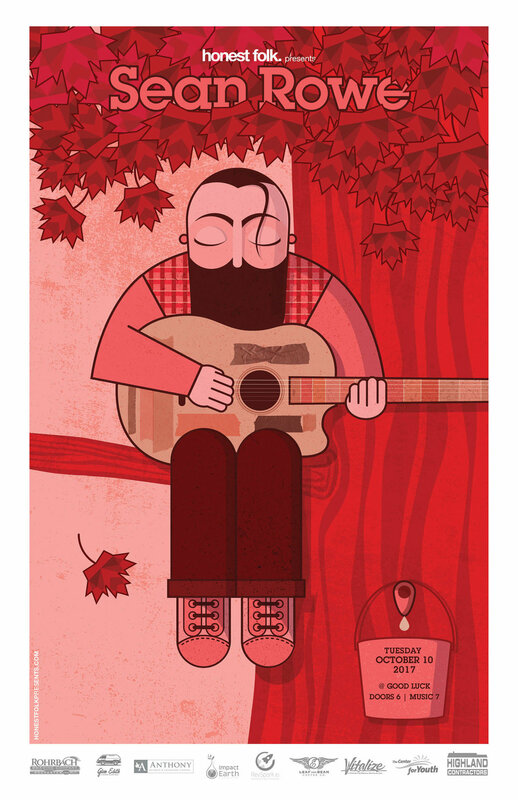 Poster for The Young Folk from Ireland, presented by HonestFolk. My wife and I met Moose nine years ago. We spotted him in a crowd of chaotic sameness where he sat in the back and gave use a yawning glance. Unlike the others around him, he had a calm, confident look in his eyes. We quickly became friends, and invited him to our house to meet our family. For nine years Moose was a fixture at our house, he became part of the family, alway eager to please, never asking for anything in return. Moose helped teach my son how to play baseball and hockey. He gave my daughters reassurance and comfort, always aware of how they felt. He had the ability to sense when someone needed him around. You would hear the sound of his nails scraping the wooden floor as he slowly walked over to you, plopping down at your feet looking up with that same calm glance from the first time we met Moose. Last Monday Moose left our family, a decision that sadly had to be made. We will miss our friend Moose. Canvas painting mounted on plywood, 96" x 48". Painted for The Carrot Company, a rotisserie and garden kitchen restaurant opening in Victor, NY. New logo design for a rotisserie + garden kitchen opening in Victor, NY. Feel free to share images or your thoughts!